This new year looks pretty promising for Hikashu fans. First of all, new album is coming soon, even sooner than we all expected. The album, tentatively titled "Ikitekoi Chinmoku," [Silence Be Alive] was recorded last November during their stay in New York. The two-days session turned out very well and the result is, according to Makigami, "very satisfying." The band is still working on the recording, but it's just adding little tweakings and no need more than that. Yes, it's supposedly almost completed right now. Unfortunately, we cannot tell about how it sounds like. But the band premired two songs from the album at Kichijoji gig last November. One is a ballad, and the other is a utterly complicated song structually. The latter even reminded us of Captain Beefheart. Very interesting indeed. So when it's out, you ask? Well, the band says it's April. Anyway, you're not supposed to wait so long. Speaking of April, Hikashu is going to tour in Russia that month. It's a very long one - two weeks throughout the country. The audience in Russia has been very supportive to the band. And Hikashu is looking forward to meeting them again. 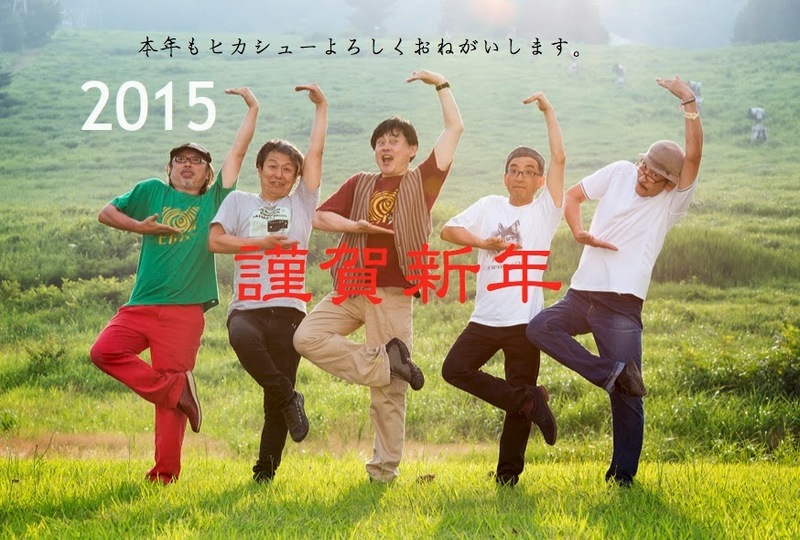 Regarding touring, the band plans to do a tour of Kyushu, southern part of Japan, in March. 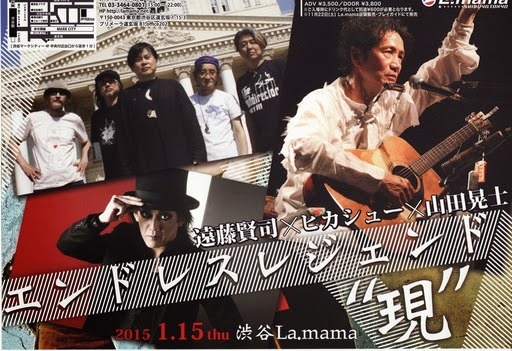 As of the member's solo activities, guitarist Mita Freeman will be 60 this summer and he says he will hold a special concert series for commemorating that. As well as being a great musician, he's a quite character so it's going to be fun. 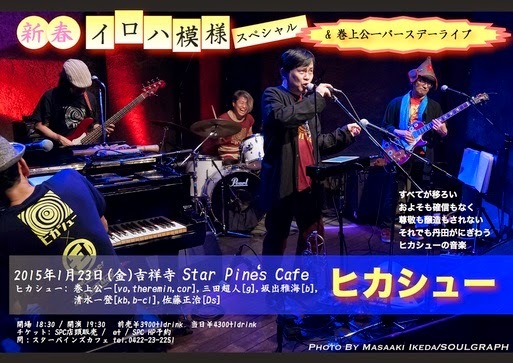 Other than that, right now the band announced only two other gigs in January - both in Tokyo which we'll cover later - but the band will be pretty active this year. You can count on that. We wish this new year will be a pleasant one for all the fans.